Hello! Today's theme is a Tape Manicure. I am terrible at these, so pardon my manicure and it's lack- lusterness lol! (do you like my new word?) I used Butter London Slapper (a birthday gift which I love love love!) and then taped off my ring and thumb and used Nina Ultra Pro Black. Then I went back in with a dotting tool and Slapper to make the line look a little wavy. 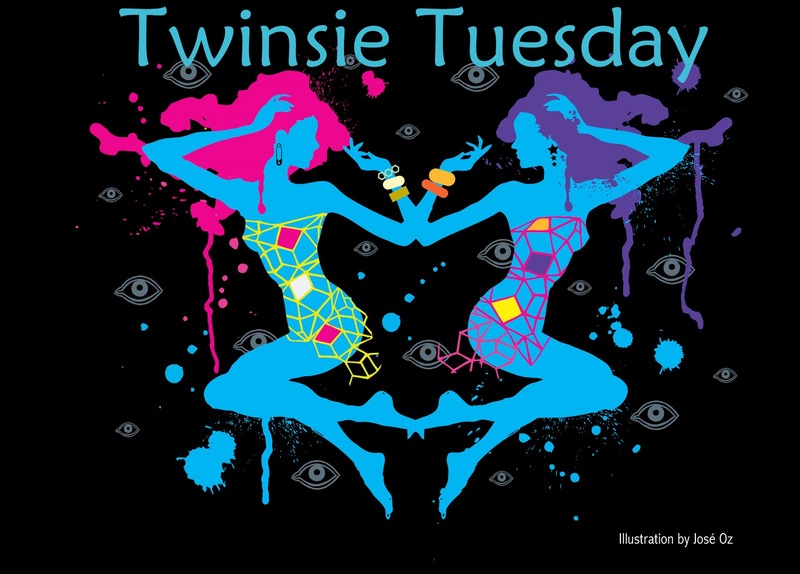 Don't forget to check out what the other Twinsie Tuesday Ladies have come up with! Thanks, it's a gorgeous color! Slapper looks so awesome! And tape mani's are right up there with stamping for me. I just can never get it right! Thanks! I think tape mani's are worse for me than stamping! Wow I love this color! Nice accent nail! Jeez that's a gorgeous colour! I think this looks pretty. I love that you made it wavy. I love Slapper. Thank you, they make some beautiful ones! I know! I'm glad I didn't tape all of them! LOL! Isn't it, I just love it! Love the wavy line, its so cute! this is great Meredith! I love the wavy line idea! I've only tried a tape mani once and was a horrible failure!! I like this green though! Yea, me and tape manis just don't work. I do love this color though! Slapper is a gorgeous shade! thanks for sharing. What lack-lusterness?! :) It's so shiny and pretty! What a cool color!!! I love slapper! I meant the tape part! Looks great! I love this shade. I just love this color! Thanks! Slapper is gorgeous! I love the scalloped look dotting the line created! Isn't it!! Haha, glad I could create another polish addict! Pretty! I love the simplicity of it! This is so pretty, I love the waviness! And Slapper looks great paired with black! I LOVE this teal color! Gorgeous! !